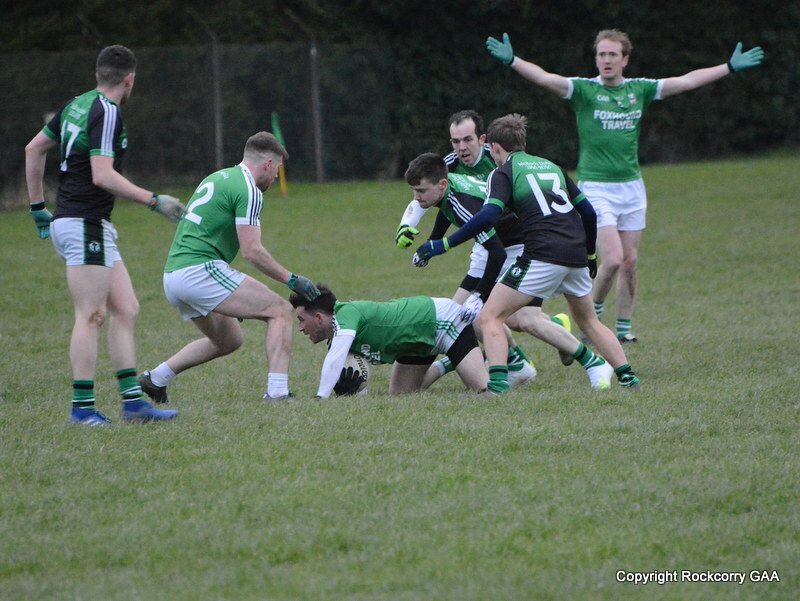 Our senior team made the short journey to O’Rahilly Park on Sunday 1st September to play our neighbours Latton in the Drumlin Credit Union senior football league. As expected the game proved to be an absorbing and pulsating encounter and while we were missing a number of our starting team the lads gave a good account of themselves and put in a tremendous performance but despite their best efforts we came off second best to a stronger Latton outfit who secured the victory on a score-line Latton 1-11 Rockcorry 0-8. With glorious Autumn sunshine basking down and a strong breeze blowing across the field the game had a relatively tentative start with both sides missing chances but Latton opened the scoring with a neat point from play on the 5th minute. Noel Carroll, playing at centre half back, made the hard yards and did the hard work with one of his trademark runs on the 8th minute and when he off-loaded to Dwayne Rooney he quickly slipped a lovely pass through to Anthony Tate who teed-up Paul McKeown and he finished in style to draw the side’s level. Two minutes later Niall McKeown broke down a promising Latton attack that instigated a swift move up the field and when he launched a long high ball it deceived the Latton defender and a lucky bounce gave Anthony Tate possession and he took full advantage and kicked a lovely point to lead 0-1 to 0-2. Latton responded immediately and equalised on the 12th minute and unfortunately the killer blow arrived two minutes later when they managed to squeeze through our defence and buried a shot, from close range, pass Jamie Smith to hit the back of the net to open up a three point cushion, Latton 1-2 Rockcorry 0-2. A free-kick from Mark Daly drifted narrowly wide on the 17th minute but moments later Paul McKeown reduced the deficit when he drove through the Latton defence and bisected the uprights with a splendid score. However, with the guile and experience of the Latton side they instantly replied with a fine score and with half time approaching they notched over another good point to lead 1-4 to 0-3 at the interval. The second half began at a blistering pace and Latton quickly stretched their advantage on the 2nd minute, albeit with a little assistance from the upright. Anthony Tate had a scoring opportunity on the 4th minute but his attempt at the target sailed wide but when Martin Carroll surged up-field on the 7th minute he delivered a pinpoint cross-field pass to Garry Calvert who sold one of his trademark dummies with perfection and pointed in style from an acute angle. Latton restored their five point advantage with a fine score, on the 11th minute, to lead 1-6 to 0-4. Mark Daly pulled back a point on the 12th minute with a fine effort that just dropped over the black-spot and two minutes later Paul McKeown gathered possession and with quick dancing feet he evaded challenges as he shimmied and weaved his way through the Latton defence and finished with a mighty score to leave the scoreboard showing Latton 1-6 Rockcorry 0-6. Damien Matthews was harshly adjudged to have fouled his opponent on the 16th minute and they duly lobbed over the resultant free-kick but this was cancelled out two minutes later when Mark McGuirk curled over a nice point following a good build up that involved Niall McKeown and Colin Quinn. Impressive approach play on the 19th minute provided Latton with a goal scoring opportunity but Jamie Smith was alert and showed quick reactions and made a remarkable save. 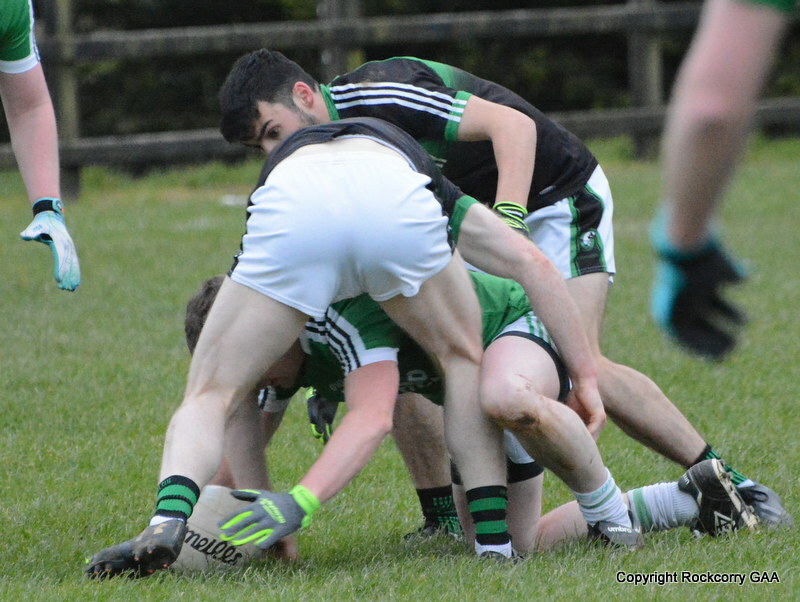 However, they did manage to increase their lead, shortly afterwards, despite good tackling and defending by Lorcan Smyth to leave the score 1-8 to 0-7. Latton then hit a five minute purple patch, starting on the 22nd minute, and they pushed further ahead when they converted three unanswered free-kicks. 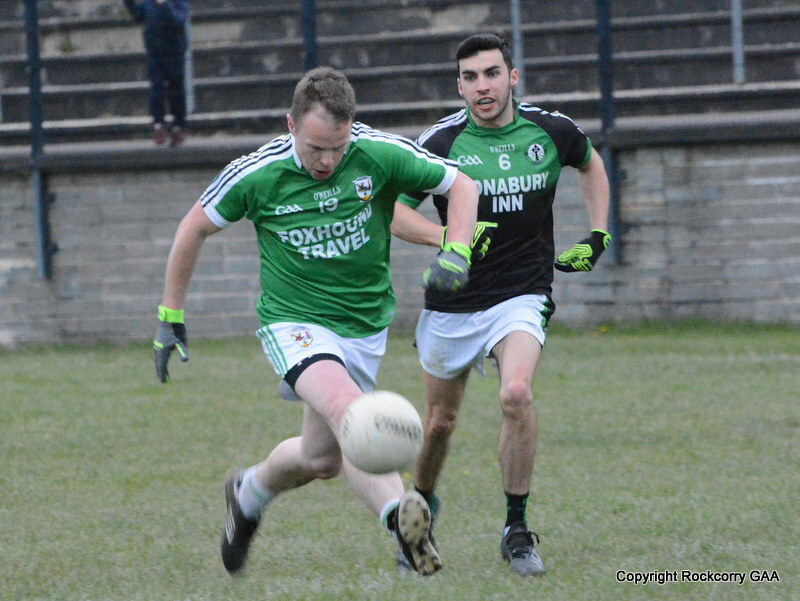 Mark Daly wrapped up the scoring on the 30th minute when he floated over a routine free-kick following a foul on Colin Quinn to leave the scoreboard showing Latton 1-11 Rockcorry 0-8. This was an exciting and entertaining tussle and everything you would expect from a local derby. On the day Latton were the better balanced team over the hour and perhaps fully deserved the spoils. 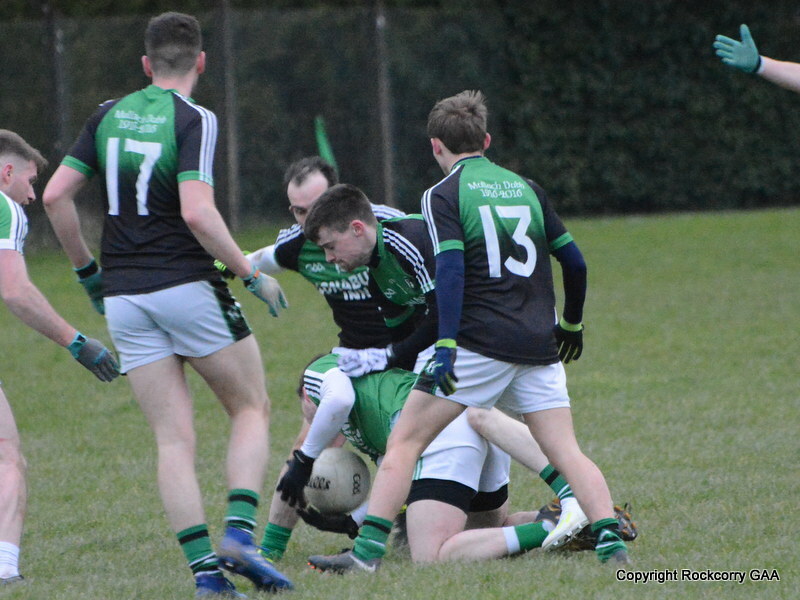 After the horror show against Scotstown last weekend the lads showed character and gave a brave & spirited performance and played with more purpose that sadly just fell short. Moving forward, I hope this display will give the lads believe and confidence for when they travel to St. Oliver Plunkett’s Park, Emyvale on Friday 6th September to play Latton again this time in the Gormley uPVC Senior Football Championship. Well done lads, I know it’s a hard road but keep at it and keep those heads held high and let’s give it our best shot! 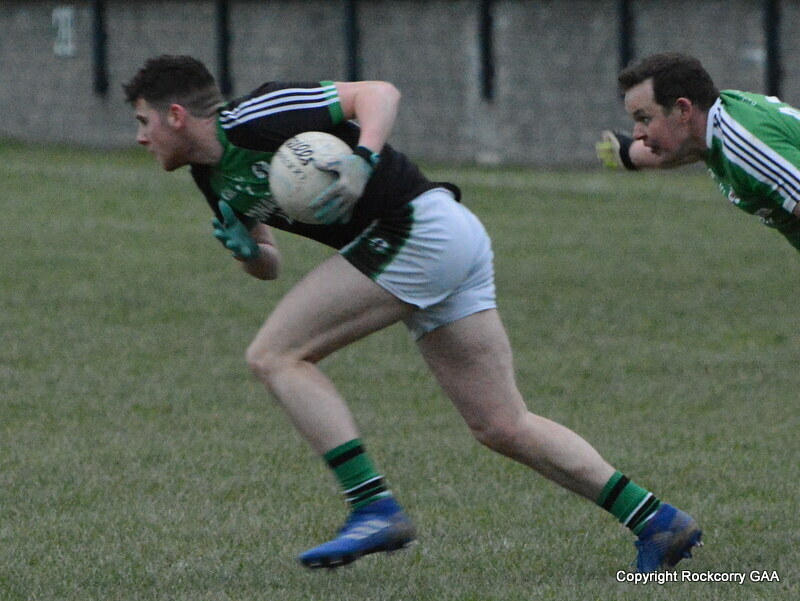 Team & Scorers: Jamie Smith, Keelan Clerkin, Niall McKeown, Damien Matthews, Colin Quinn, Noel Carroll, Stephen Lynch, Mark Daly (0-2, 0-1f) Martin Carroll, Paul McKeown (0-3), Lorcan Smyth, Conor McGeough, Anthony Tate (0-1), Mark McGuirk (0-1) and Dwayne Rooney. Subs used: Garry Calvert (0-1) for Conor McGeough, Cathal Sheridan for Stephen Lynch (injured).